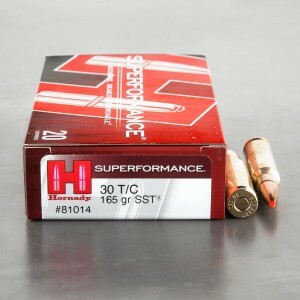 30 T/C (Thompson Center) ammunition is one of the newer rounds on the market. Introduced in 2007 and designed by Hornady for Thompson Center arms, the round utilizes the most advanced ammunition technology and design features. The 30 T/C uses a 7.62 mm projectile and a slightly shorter case length than the extremely popular 308 round. The design goal of the 30 T/C was to build a cartridge that could perform with the same power as the famed 30-06, but in a short action. Great ammo, accurate, reliable and best of all, very affordable! You can't go wrong with that combination! Ammo To Go had the very best price on the web, keep up the good work!